I’m a fan of neighbourhood policing, but one of its weaknesses, I think, is that the public are not particularly empowered to hold the police to account. Part of this is in the weakness of the data provided. To a degree this is not the fault of police (at least locally) since they are police or community support officers, not statisticians. They can hardly be expected to also give a robust analysis of crime data. The result is that members of the public tend to get a list of numbers at the meeting that are hard to make sense of and offer no real context. I suspect the police may argue that mapping provides that accountability, but I’m not sure that in ordinary circumstances mapping enables people to get a feel for what is happening and the overall trends: in other words, are the police winning or losing? Which prompted me to quickly play with the figures from the Met’s mapping website. I’m not sure I established the answer. My first attempt was to compare the figures for total offences in the ward over the past two years. 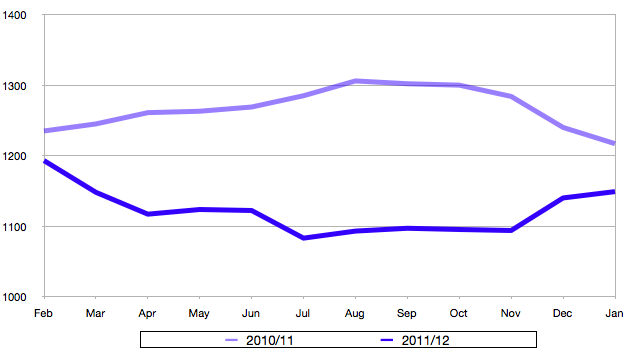 This compares the only monthly ward data available, from February 2010 until January 2012. My thinking was that comparing year for year would reveal any seasonal trends and allow an easy comparison, the 2011/12 year should be lower if the police are succeeding in reducing crime. However, the figures are relatively low (between 58 and 133 crimes per month) and there are all sorts of factors that can create peaks and troughs that skew the comparison. My next try was a cumulative figure for the two years in question, in other words, the total crime since the start point (in this case February 2010 and February 2011). 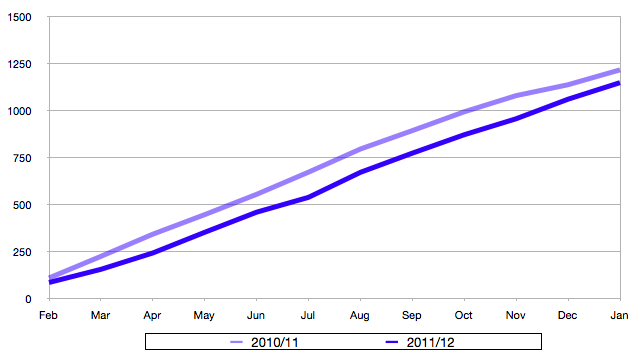 Total notifiable offences in Shaftesbury ward cumulative figures by month, February 2010 - January 2012. My thinking is that this helps make the graphs easier to read, because they don’t have the jumps, and makes it clearer that year on year performance is better or worse. However, I think it does make it a bit harder to see the comparative trend. My final attempt at graphing performance was a running cumulative total, so the data point for each month contains the total crime for the preceding 12 months. This has the major disadvantage that the Met only provide 24 months of data, so there is no ward data available before February 2010. The only older data is at borough level and the most recent provided is for the 2008/09 financial year. To see if it made sense I bodged something together from the London Datastore, which has crime rates by ward up to the 2009/2010 financial year. Far from perfect, but it means I can create data for February 2009 to January 2010 that isn’t too far wide of the mark. 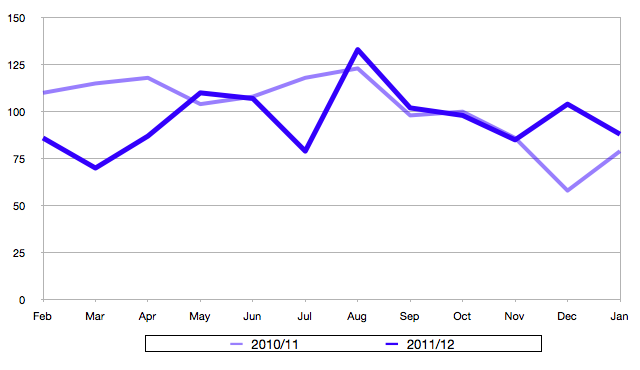 Total notifiable offences in Shaftesbury ward rolling 12 month total by month, February 2010 - January 2012. Imperfect data aside, I think I prefer this one. It does make crime look high, since a twelve month figure is plotted to a single month, however, it removes the sudden changes of monthly data, makes it clear that, overall crime is lower, but also retains a sense of trend, since the line moves up when crime increases compared to the same month from the previous year. Would publishing these regularly help the ward panels hold their SNTs to account? I don’t know. Indeed, not being a statistician myself I don’t know how valid they are. However, as a resident, I feel I have a better idea of the general crime picture and trends in the ward because of them. What do you think? To be brief, I like the first one best. In trying to iron out the data, the other two inevitably have to be more complicated, and it took me three attempts at reading the third one 3 times to figure out what it was showing. Those issues could be solved through design, and the second does give a clear message (‘Crime’s down. Yay.’), but the reasons you give for trying to improve on the first one are ultimately the reasons I like it – the seasonal (or other) reasons for the ups and downs provoke more questions and discussion, and I think that would be a more profitable way to both engage the public and hold the police to account, then a simple ‘crime’s down’, which is a certainly a good bit of communication to the public but doesn’t invoke any interest or lead to further improvements. I guess really I’m just saying that they’re two different types of message, rather than better/worse. Though the third graph actually shows that recently crime’s gone up.